Wildbloom Vert embodies the woman who quietly yet smartly steals the show and captivates in her own unique way. Naturally feminine, delicate and soft, her alter-­‐ego is vivacious, fresh and spirited. Her passion is undeniable, her personality is contagious and her laughter, infectious. She trusts her instincts and is not afraid to fall in love, live in love and be loved in return. Wildbloom Vert was developed by perfumer Ilias Ermenidis; the notes include pear, violet leaves, apple, peach blossom, gardenia, magnolia, coconut wood, teakwood, sandalwood and musk. 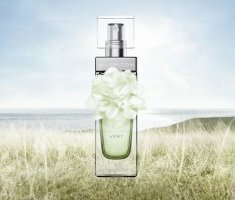 Banana Republic Wildbloom Vert is available in 50 ml Eau de Parfum. I like all the notes except pear and apple. I hope it’s greener than sweet. I’m pretty anti-pear myself, and only slightly less anti-apple. I wish the word “infectious” would stop appearing in perfume marketing copy. Hey Robin, I live in the U.S. and you have permission to use my email address- if I win. My favorite floral is FlowerBomb. Thanks alot!! I’m not a big fan of either apple or pear in perfumes, yet somehow this list of notes makes me want to venture into Banana Republic and give this scent a cautious sniff…or two.